These days, it’s more difficult for people to be intensely invested in a cause when the minutiae of daily life are constantly pulling them in different directions. Thanks to the Internet, however, more thoroughfares are connecting people, and a different sort of kinetic energy is fomenting a resurgence of interest, passion, and action. The organization is another manifestation of the creative class. According to Dr. Richard Florida, a social scientist at George Mason University, the creative class refers to the growing group of creative professionals in the USA. Schroeder explains that the interest in the creative class has been brought on by Web 2.0 tools such as Flickr and YouTube. To get its message across, All Day Buffet aligns itself with other brands that promote responsible consumerism like Method, “an E.O.M.E.D – Equal Opportunity Movement for the Environment and Design,” created in 1999 by two friends; or the company (Red), whose simple business model gives consumers the chance to decide to whom and where a portion of the profits go for products they need every day. For example, at no cost to the consumer (Red) will give a portion of their profits to help combat AIDS in Africa, by supplying anti-retroviral medication to sick individuals. So what does All Day Buffet do? One of their main programs, Cause for Drinks, facilitates a series of bi-monthly happy hours in cities across the country – New York, New Orleans, Austin, San Francisco, Seattle, Minneapolis, Columbus, Richmond, and Annapolis. Two dollars of each drink go to that month’s chosen non-profit. “One month we’re supporting creativity in New Orleans and the next month we’re supporting Burma,” explains Schroeder. All Day Buffet tries to keep events as simple as possible. Each city has a designated host or hosts who are responsible for determining the local details – like location. This “open-participation” style leaves ample room for interpretation and fun: “We create the flyer, find the non-profit to benefit, and help publicize the event on our site and monthly newsletter,” explains Schroeder. The rest is up to the hosts. All Day Buffet’s most recent Cause For Drinks was held at 90 Proof downtown on Wednesday, January 16th. Dappled lighting and good music urged a slew of young professionals and non-profit industry personnel into the venue to chat, enjoy some after-work libations, and contribute to the People’s Community Clinic, the chosen charity sponsored by the event. Founded in 1970 by a group of volunteer doctors and nurses, the People’s Community Clinic is unique in that it’s one of the longest-running independent clinics for primary care. The Clinic is a non-profit facility and privately funded, and it provides comprehensive health and wellness care to limited income individuals and families in the area. Centrally located, the People’s Community Clinic currently services and provides quality medications to 11,000 patients – all uninsured – and has a generous staff whose specialties range from prenatal to elder care. 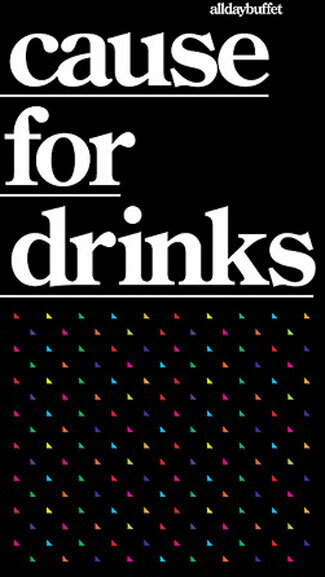 This month’s Cause for Drinks has been scheduled for 6:30–8:30pm on February 20. Though location has yet to be determined, the theme will be “Idea Generation.” People will contribute ideas and several of those ideas will be supported by the money raised across the country, showcased via the web and at the next event. You can keep an eye on All Day Buffet’s website or sign up for their monthly newsletter for information on the next evening of drinks and social justice.